More than 40 years after the Vietnam War, veterans are still seeing the side effects caused by herbicides such as Agent Orange. 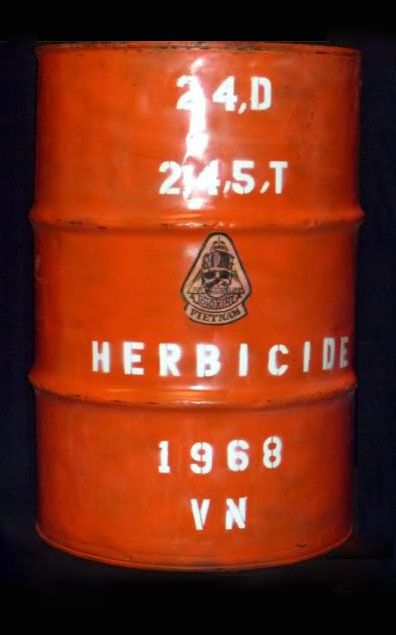 Agent Orange was used during the Vietnam War to help clear foliage in which provided enemy cover. Approximately 3 million Americans served during the Vietnam War and nearly 1.5 million were exposed to Agent Orange. Most of the herbicide spraying was done between 1962-1971 by airplanes, helicopters, boats, trucks and even by soldiers using backpack sprayers. Overall around 20 million gallons of Agent Orange was sprayed during the Vietnam War. These 20 million gallons were breathed in, ingested through contaminated food or drink, seeped in through the skin and eyes and through open wounds or broken skin. Needless to say, it was easy to be exposed to Agent Orange during the Vietnam War. The exposure included toxic chemicals such as; 2, 4- dichlorophenoxyacetic acid (2, 4-D) and 2, 4, 5- trichlorophenoxyacetic acid (2, 4, 5- T). There are many conditions that the VA considers to be service connected to Agent Orange, which are listed on their website. Some conditions include; Chronic B-cell Leukemias, Ischemic Heart Disease, Hodgkin’s disease, etc. For a complete list of conditions, visit va.gov. If you or a loved one were exposed to Agent Orange during the Vietnam War and are experiencing side effects you believe to be connected to exposure, call us. Our Veterans Disability Lawyers are experienced in VA Law and will fight to help you get all of the benefits you deserve. Call for a free consultation, submit an online form or chat with an Intake Specialist live on our website.